Among the genus sedum, creeping red sedum offers a tough-as-nails plant with colorful flowers. Sedums are drought-tolerant, bloom nearly all season, and grow where other plants can't live. They're a great addition to the garden but particularly useful to cover slopes, rocky ground, or stone walls. Creeping sedum also go by the name stonecrop, perhaps because the 'crop' appears to grow straight out of rocks and stones. They creep by extending runners out from the parent plant. The runners root, then send out new shoots, creating a dense mat of plants. Creeping sedums can grow in almost any soil or in places with little soil, such as in between the rocks in a rock wall or along a walkway. Many people plant them on garden pathways because these tough plants even spring back from being stepped on! Like all sedums, creeping red sedum is a tough plant. It needs full sun but in the southern United States and in very hot areas it can also dwell in partial shade. Sedum actually prefers poor soil, but when planting it, it benefits from some compost mixed into the soil to create good drainage. Sedums prefer well drained soil and may not do well if they're kept too wet or in boggy areas. They're drought tolerant and makes an excellent plant for those areas of the garden where nothing seems to flourish. Sedium spurium "Red Carpet": As the name suggests, this sedum grows into a red, carpet-like mass of flowers. The foliage itself is tinted with red throughout the growing season. In the fall, the red color deepens to a dark burgundy. Red Carpet sedum spreads more slowly than other varieties but the color is worth the wait. 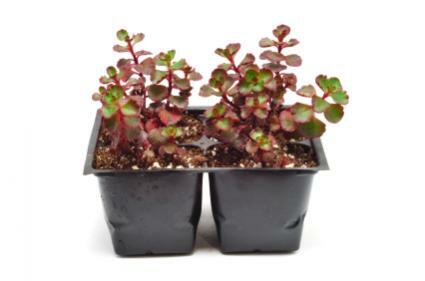 Sedium spurium "Dragon's Blood": Dragon's Blood sedum is another very popular creeping red variety. It is also called "Fulda Glow" or "Fuldaglut" sedum. Dragon's Blood starts blooming in June and doesn't stop until well into the fall, producing a series of rich red, star-shaped flowers all over the plant. The plants stay colorful even during the winter. It's also very hard and disease resistant. In addition to covering stonewalls and walkways, sedums are great for erosion control. Choose a fast-growing sedum that will spread quickly to cover a slope. The roots hold the soil in place and provide a welcome mat of red-tinted foliage during the growing season. Most red sedums begin blooming in early summer and provide a carpet of blossoms until the first frost. The entire group of plants called sedums or stonecrop should be nicknamed the lazy gardener's plant because they are probably the most easy-care, worry free perennial you can add to your garden. They don't require fertilizer or watering, and cover areas prone to weeds, suppressing weeds while providing colorful foliage and flowers. They spread easily and offspring plants can be moved into other parts of the garden. If you're time pressed or have areas of the garden difficult to cultivate, you can't go wrong with sedum. Sedums are readily available at national home and garden stores, nursery and garden centers, and online plant catalogs, and are an affordable plant to add to the garden.